First of all, we hope that everyone had fun Saturday!! In our eyes, everyone’s a winner when 104 teams can come together on one day and play this amazingly fun game! But…. not everyone walks home with trophy ;0) Here are your Division Winners. Congratulations on a battle well fought!! Mark your calendars for July 14th, 2018 for the 11th Annual Summer Sizzler!! Best Team Name…. The Goal-Rillas!! Here is the map for the tent spaces. As you can see, we only have 74 tent spots and 104 teams. We know this stresses many of you out. We had 115 teams last year and did well…so we’re sure we can do that again!! PLEASE…when Suzanne calls you, be kind to her…she’s only following instructions :0). If you are bringing multiple teams, we’d like you to consider condensing your tent spaces to the minimum. Remember, when she calls and no one picks up, she will leave a message. You are then to text her back at the number she called from and when she gets off the phone, she will call you right back. Please don’t ask her to save your friend a spot next to you…it’s first registered AND paid first called. That’s the benefit for those who registered early!! Please check the schedule Friday night in case there are any changes that apply to your plans for Saturday morning. Any dire messages will go out on Twitter @sizzler3v3. Schedules are ready. There is a PDF link at the bottom of this message. Please look over everything carefully…and make sure your parents/players look everything over carefully as well. We have attached the entire tournament book so you can see who our sponsors are, parking information, Friday night check in times, what you can and can’t bring to the fields on Saturday (NO ANIMALS). If you see any mistakes, please contact Missy at 830-5190 immediately. Any changes that we make will be highlighted in yellow so you can see the change has been made and we will contact all parties involved in the change. We had at least 1/2 of the coaches request to not be double booked on a time slot. This just gets impossible when scheduling over 100 teams. Please don’t ask us to change any of those games. We’re very sorry if that occurred. Hopefully one of your other parents can step in and have fun with the kids!! We will open on Saturday at 7am (please don’t come any earlier than that). Games begin at 8:00am sharp. (Friday check in is 6:30pm-7:30pm…the info is in the attachment). Tent space phone calls will happen on Thursday. This gives you time to look at the schedule and see where you’d like to set up shop. We have roughly 80 tent spots and 104 teams…so if you are bringing 3 teams, see if you can just use 2 tent spaces. That way everyone gets to enjoy being on the field! Remember…this is a FUN EVENT…. try not to get too wound up over little things. Keep in mind that some of our referees have very little experience and some have a lot of experience. They are all doing their best!! The HS kids get very nervous out there and if you holler at them…it will make them even more so. If you have ANY questions, feel free to call or email. If you need help the day of (someone gets hurt, sick etc…) we will have field marshals in orange vest between fields. Get their attention and they will radio for help. Sorry for the novel. Just want to make sure everyone has the info they need. We’ll be sending out an email with the same info. Please share with your players/parents!! Oh, Also… right now there is a slight chance of rain for Saturday. We will keep everyone posted on any delays on our TWITTER account @Sizzler3v3. This is by far the easiest way to reach mass amounts of people. Remember…if the whole thing were to get canceled…the rainout date is Sunday…same times for everything. If it’s not lightening…you can bet we’re probably going to be playing…anyone remember 2009?? DOWN POUR right up until game time!! All divisions are FULL. Schedules have been made…but we still need to comb thru them to make sure everything is correct before we post them. We anticipate on posting schedules on Wed!! We have emailed or spoken to everyone who was on the wait list and did not get in. We’re very sorry….but we filled up extremely fast this year. TENT SPACE. We sent out an email last week about tent spaces. If you registered after Wed you may not have received it. We will be calling every team in the tournament on THURSDAY to reserve your tent spot. We want the schedules to come out first so you can see where your team will be playing. The contact number you entered when you registered is the number we will call. If you don’t answer, we will leave a message and continue down the list. We suggest reply texting to the number that called you with your name and number… and they will call you right back. If you call and they are on the other line and don’t pick up…don’t leave a voicemail.They may not get to it as quickly…texting is the safer choice! We have just over 100 teams and right at 100 tent spots. If you have multiple teams and are capable of taking less tent spots than you have teams ~ that would be helpful!! A map of the tent #’s and their locations will be posted along with the schedule on Wed. We will email everyone as soon as they are ready!! Looking forward to another great Sizzler…. REGISTRATION IS OPEN!!! Click on the link below to register your team for the 10th ANNUAL SUMMER SIZZLER!!!! 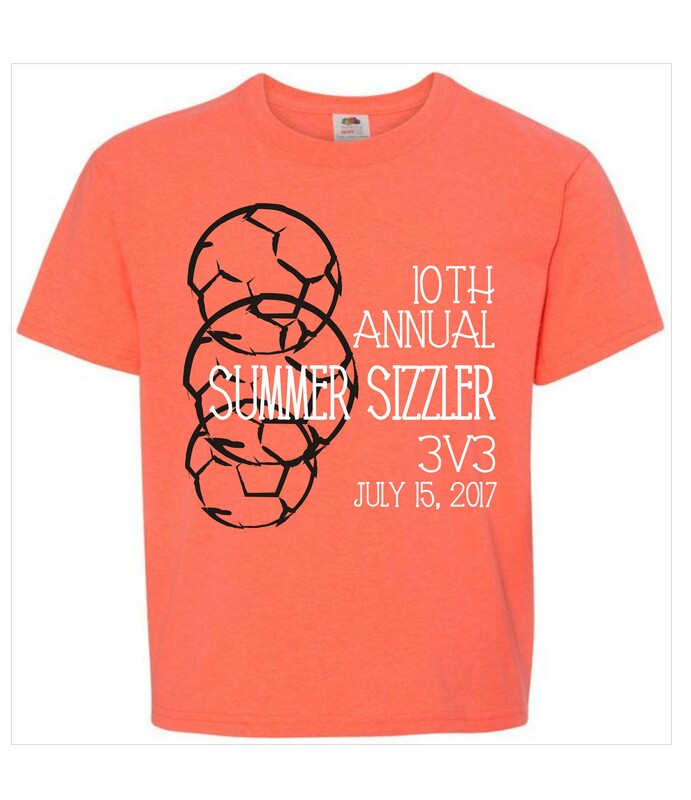 Welcome the the 10th Annual Summer Sizzler 3v3!! We are so happy that you want to join us! If you are returning….welcome back!! If you are new, you’re in for a treat! Last year we had 115 teams. We can not accommodate more than that…so we will put a cut off on registrations at some point. Don’t wait….get registered now!! The cost is still the same…$100. 2 person minimum, 5 person maximum. You’ll enter your team by the GRADE that your oldest player will be entering in the Fall school year. The official rules/paperwork will be updated and posted over the coming days. We don’t see the rules changing…so you’re welcome to read those over and realize that the dates will most likely be incorrect for now.